In my many years on Pinterest, both as a Pinner and as a Pinterest VA running audits for brands, I have made and seen others make a bunch of mistakes that impacted the overall performance of an account. 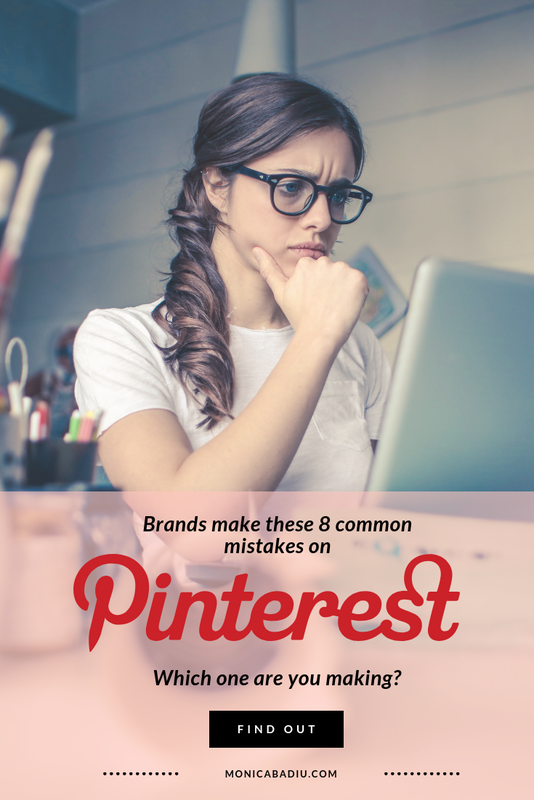 I strongly believe we all need to learn from mistakes to improve, innovate and better our marketing strategies, that is why I am sharing with you a list of eight mistakes that I’ve seen brands make on Pinterest. Some are very common mistakes, others are a bit more complex. But all of these are essential mistakes, some potentially at very root of the why you’re not seeing any results from Pinterest. And I’m sure many of you have perceived them as issues, gone through fixing them or simply procrastinated until, oh well, now? By fixing these 8 common mistakes, in time, you will start seeing improvement and get increased website traffic and saves on your Pinterest accounts. There are so many brands actively trying to get recognition online that users have developed a sort of checklist that tells them if an identity looks authentic or not. One of them has to do with the consistency of a brand’s presence online and that includes profile pics, bios, call to actions and headlines. And this takes me to the first most common mistake I’ve seen brands making on Pinterest. They use a different profile pic, title and bio than what they’ve served users on their website’s about page, Instagram or Facebook. Imagine this: you look for a yummy holiday recipe on Pinterest, you find it and love the content a food blogger has in their boards. You check their profile pic, love their bio and decide to go on their website to learn more. And yet, when you go on their website and see their online persona there, something doesn’t feel right. It has to do with your subconscious as your brain is looking for patterns. You were expecting to “see” the same person on Pinterest. But their primary pic on their blog or website is different (haircuts, setups, glasses, no glasses, different hair color etc), and to make things worse even their name is different (full name on website vs nickname on Pinterest etc). With so many brands competing for attention, your potential customer or audience needs to know first hand how you are going to provide value for the time they invest in your content. You should try to make them feel like your entire world revolves around making their lives better. Yet, I’ve seen many brands making the mistake of ignoring their audience, by making their Pinterest bio all about themselves and not about the audience. Essentially they are solely presenting characteristics, and not benefits. For instance, I could go on Pinterest and write in my profile bio that I am an entrepreneur, a marketing consultant, Pinterest VA, a photographer and a DIY blogger who loves to travel. While that indicates my characteristics, it doesn’t tell people what kind of content they should expect to see, and how will my unique characteristics provide value (benefits) to them. Plus, it’s always useful to explain specifically how you’re planning on helping a specific audience solve their problems. I am going to repeat myself. Ladies, competition is fierce nowadays. You need to be very smart about how you present yourselves online and rather than go for the wide angle, try to be as present as possible for your specific audience. Starting with your Pinterest bio and working up to your boards, group boards, pins and blog content calendar, there are various opportunities for you to present your brand, create content for your core audience and provide this group of people with valuable, beautifully curated information. If you’re a real estate agent using Pinterest to appeal to high-end home buyers they might not be interested in recipes for home cooked casseroles, but they would get a kick from a board where you add content about the nicest restaurants in the areas you serve. This group of people would also like to know what are the best shopping spots, what kind of entertainment there might be around, what celebrities are living (vacationing) in the areas you serve and could even enjoy getting some fashion inspiration. If you’re a travel agent using Pinterest to promote your hiking tours in the Andes, create boards that will give them a clear peak at whatever they might need to know about such excursions, as well as prep work (fitness regimen, diet) and inspire them with awesome lifestyle boards, health, scenery, the local people and yes, food. When brands first start their Pinterest profile they feel like they are under pressure to create awesome content immediately, to pin hundreds of post every day, to create hundreds of boards in their first week. Don’t get me wrong, I know the pressure and I also know how addictive Pinterest gets once you start pinning. So much beautiful content all around that needs to be pinned immediately. Yet pinning without a strategy and without proper research basically translates into pinning without purpose. Which essentially means you are losing money, time and increasing your website bounce rate when Pinners go to your website only to find out your brand is doing something entirely different than what you’re pinning about. That’s a surefire way to alienate audiences and waste resources. And it all starts with those cute board titles that don’t get you found on Pinterest. Sure, it’s easy to justify that your cute board titles are part of your entire brand identity, but if Pinners can’t find your content, how are they going to experience your brand? To create SEO friendly Pinterest board titles you need to have three things: a buyer persona/target audience, a pinning strategy and research. I’ll go over identifying your target audience and creating a pinning strategy in future posts, but I’m going to try and summarize researching Pinterest for board titles that will get you found. Find out how much engagement boards with similar content might have by clicking the button at the right of the search bar and selecting “Boards”. Research the displayed results and figure out if there’s demand by looking at number of pins and number of followers per board. This is one of the simplest way to research for boards’ titles that get you found. Another way would be to navigate Pinterest Interests. There’s a great podcast episode from Simple Pin Media about it that has more information on this. I know writing boards’ descriptions isn’t something that is easy or fun. But it is necessary. I like to tell my clients that they should think of their Pinterest boards as website pages. One spends a lot of time with optimizing their website pages for Google SEO - it starts with the page title, page url, page description and body content. It’s a must that our websites are SEO friendly, right? But Pinterest boards are basically the same thing. They too need your TLC. I’ve seen brands ignoring this aspect of Pinterest SEO either by not posting any text whatsoever in their boards’ descriptions, by using a what appears to be a random string of keywords or by using a couple of hashtags and that’s it. Not to mention they aren’t using call to actions to send people to their websites. That’s the entire point on Pinterest. To inspire people with your content and send them to your websites. But when you fail to provide enough context, a call to action and the right keywords, you’re basically just missing out on new Pinterest followers and website visitors. You have 500 characters to wow your visitors. You have an additional opportunity to be charismatic, helpful and engaging. Use this opportunity to welcome your audience into your world, to explain what they’re going to see in this board and let them know there’s a special place on your website where they can go to get a freebie or read more about the topic. A couple of years ago, when Pinterest was just on the rise, getting on group boards immediately meant more reach. Nowadays, brands need to be more strategic about which group boards they chose to pin for. Essentially, over the years many brands on Pinterest have collected dozens of such group boards in their list. And they make the mistake of prioritizing those boards over their own. This is one of the mistakes brands make on Pinterest that’s also the easiest to fix. First of all, fix the order your boards appear in. You are interested in getting your own content in front of as many people as possible, so when someone clicks to see all of your boards it’s good practice to put your own boards at the top and leave the group boards at the bottom. You are also interested in getting as many people as possible to visit your website. When your audience opens one of the group boards you’re part of, they see all the pins group members have posted. Yours might not even be visible anymore, especially if it’s a group board with hundreds and thousands of members. It’s easy to get swept away and start creating hundreds of new boards. You get an idea that would totally work for your brand, and then you get a second one, and a third one. Sooner than later you realize you have hundreds of boards and not enough pins to populate them. Even worse, you realize you’re getting further and further away from your initial purpose, straying away from your content calendar. And let me tell you right now - if you’re having a hard time creating content for your blog, you’re going to have even a harder time finding the right content to pin in your hundred or something boards. But brands often make this mistake, trying to be on top of it all, rather than taking it step by step, and committing to 15, 20 boards that get them traffic and new followers every day. There are so many tasks to go through on a daily basis that sometimes brands forget about pinning at all or binge pin in a day what they’d normally save in a month. And inconsistent pinning is by far one of the most damaging mistakes brands make on Pinterest. You could pin as little as 5 posts per day, but make sure you keep up with the number, and pin that every day. We might not know all the ingredients to Pinterest’s algorithm but we know that pin quality and consistency are part of it. So if you don’t have time to pin 15 or 20 times a day, make time for those 5. And for the love of God, use a scheduler to help you navigate it all. Tailwind is a great way to start. I’ve been using it for about 4 years now and it’s not only a time-saver, it also helps you figure out when is the best time to pin and which of your pins or boards are highly performant. To make the most of your investment, I recommend using Tailwind after you have figured out your target audience, your pinning strategy and pinning calendar. Are you making these 8 mistakes with your Pinterest account? Many brands jump on Pinterest without considering they need a couple of things to get them a powerful and solid start. Many brands start on Pinterest with a preconception that undermines their efforts to grow. Pinterest is not like any other social media platform and if you’d ask any Pinterest VA or marketing consultant they are going to refer to Pinterest as a visual search engine. And to rock it you need to have a target audience, a pinning strategy and a content calendar. If you’ve caught yourself making some of the mistakes brands make on Pinterest, don’t panic. Everything has a solution and as they say, recognizing the problem is the first step to getting better. If you need help figuring out what kind of mistakes you’ve been making with your Pinterest strategy or just need procedures to follow, send me a message and let’s work together. I help brands grow on Pinterest through profile audits, account cleanups, optimizations and full management.